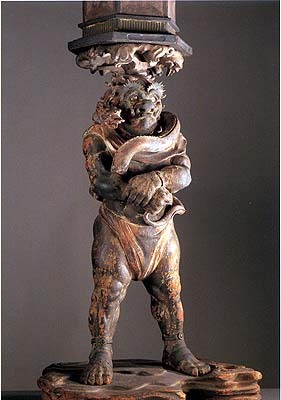 The dwarf Ryutoki (1215; height: 31"), a snake wrapped around his chest, is shown bearing an offering lantern on his head. This symbolizes the conversion of demons to Buddhism and their acceptance of Buddhist law, a form of religious usurpation. The statue shows a ready wit, and many felicities of style. Its sculptor is Koben, one of Unkei's four sons. This statue is paired with another, Tentoki (not shown), of a demon carrying a similar lantern on his shoulder. The Tentoki statue is considered by some authorities to be the work of a different sculptor, while others assign it to Koben.